Lazy Ox Canteen was on my radar for a while. 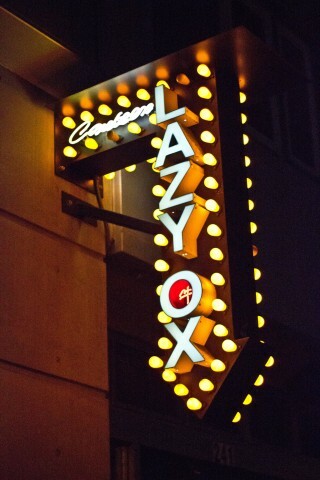 Any time I was in Downtown or in Little Tokyo, I always had Lazy Ox in the back of my mind. Luckily, it was food blogger appreciation week at the restaurant, and the owner invited me and a guest for some food. Though I realize how this can change the outcome of my blog post, it was a chance for me to finally try their food nonetheless. Eating here, I tried to have the most unbiased and wanted to be as objective as possible. 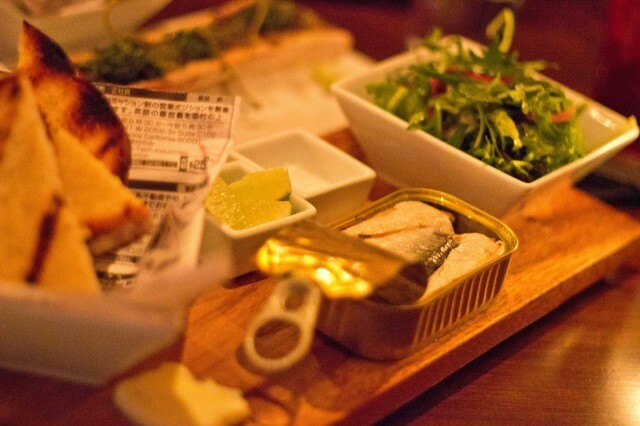 A hip bar/restaurant with small plates of delicious food near Little Tokyo, Lazy Ox Canteen is a gastropub that is much needed in this area. The experience was fun, and we surely ate a lot — the food seemed almost endless. The chicory salad was a great start. The bitter leaves and the tangy blue cheese went perfectly together. They almost cancelled each other out. 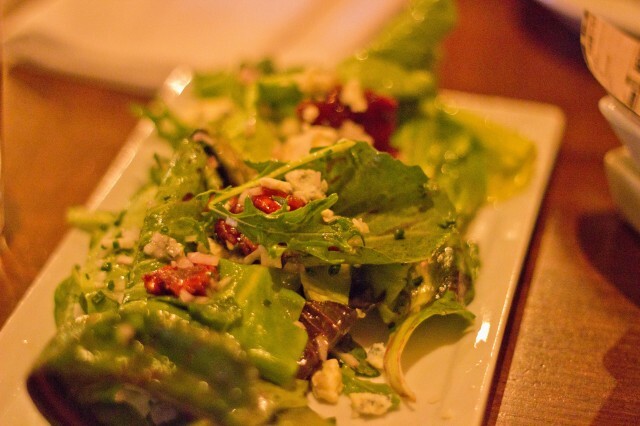 The saucy vinaigrette was delicious with the candied pecans gave a great crunch to the dish. It was good to have salad at the begining — salad is rarely a choice of my own. It is either complimentary, and or it has bacon in it. This salad was good enough to have me consider salads a little more often. I love a good fatty bone marrow sometimes. Not all the time, but when I’m in the mood, nothing is better. 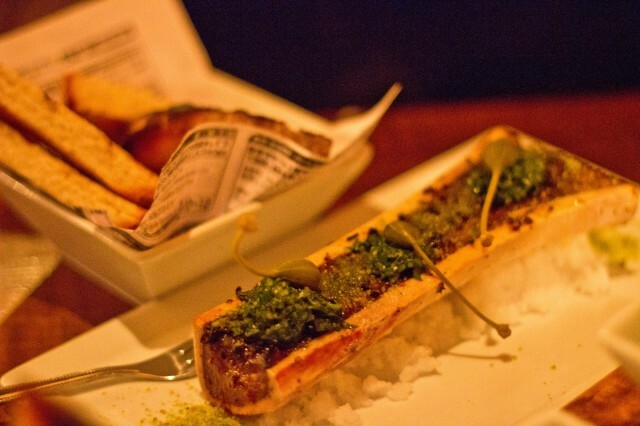 Lazy Ox’s roasted bone marrow was perfect. The garlic, thyme, and orange gremolata came together to flavor the bone marrow nicely. Spreading it on their toast, with a sprinkle of their gourmet salt made for one unctuous bite. A bite of the caper berries was salty and sour which cleansed the palate nicely. I was then ready for more. 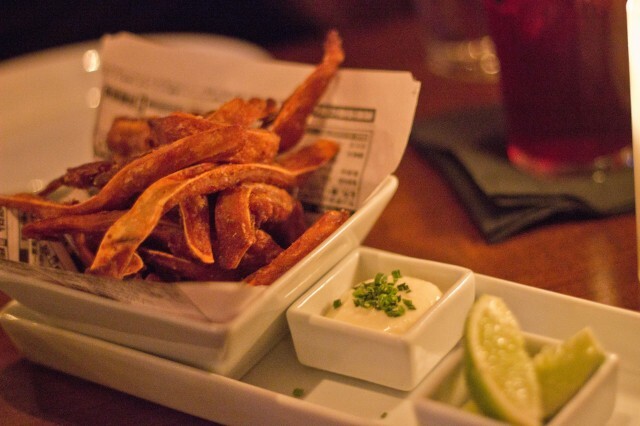 It’s obvious that all gastropubs do their own rendition of the fried pig ears. This one, actually, was quite different. This one was cut somewhat thick. The seasoning was nice and the horseradish aioli was perfect. What was different was the texture. It wasn’t crispy and teeth shattering like other places. This was more tender, fatty, and gelatinous. Though fried, their process didn’t render out all the fat and didn’t crisp up. This made for a more meaty fried pigs ear. Not necessarily a bad thing — just different. The Can o’ Sardines was interesting enough for me to want to try it. Not really scared of sardines, I actually like the strong taste of sardines. This can of sardines came from Galician, a region northwest of Spain. Eating it with the bread with their house-churned butter, the fish had a very strong fish flavor. To add to the mix, a side of herb salad helped bring everything together. 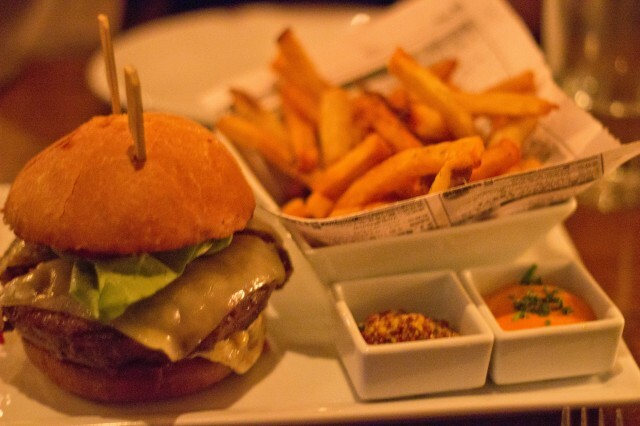 Every gastropub needs a good burger. I tend to grade any restaurant by their burger. The 7 oz. Lazy Ox burger had some top notch ingredients. The beef itself was perfectly cooked and the flavor of the beef was pristine. The melted Bravo Farms white cheddar was subtle, yet had a presence. My only gripe about this burger was the bun. It was too dense and kind of took over the burger, not allowing the beef to shine. I think an airy, more fluffy bun would allow the flavors come through. The whole grain mustard was a nice touch as to reset my palate. The fries on the side weren’t bad either, especially dipping with draigo paprika aioli. It was crunchy and a great companion to this near perfect burger. 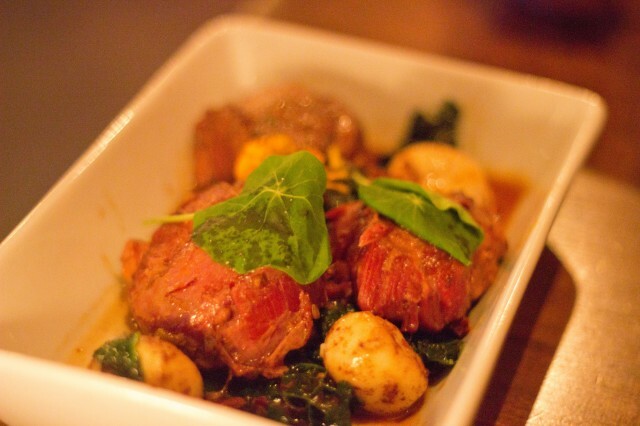 The final portion on the savory side was the pork cheeks. Cooked for who knows how long, the pork cheeks were left as tender as can be. Little effort was needed to chew. The goat cheese gnudi balls were flavorful and velvety smooth. The cooked rutabaga gave the dish some earthiness. Everything mixed in the violet mustard made a gravy like substance. It was savory, yet tangy, but all delicious. It was time to put a perfect ending to these serious of plates. 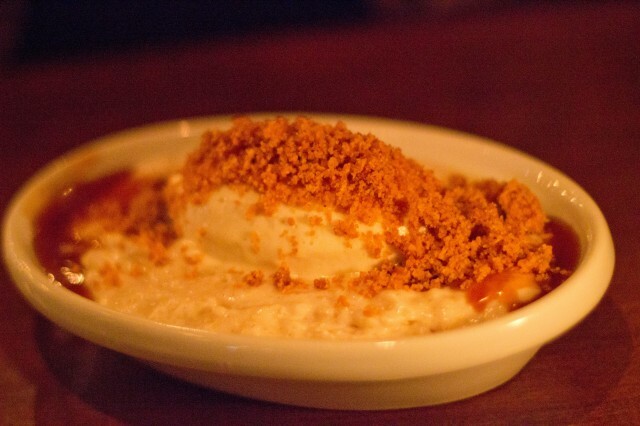 We opted for the rice pudding and butterscotch pudding. 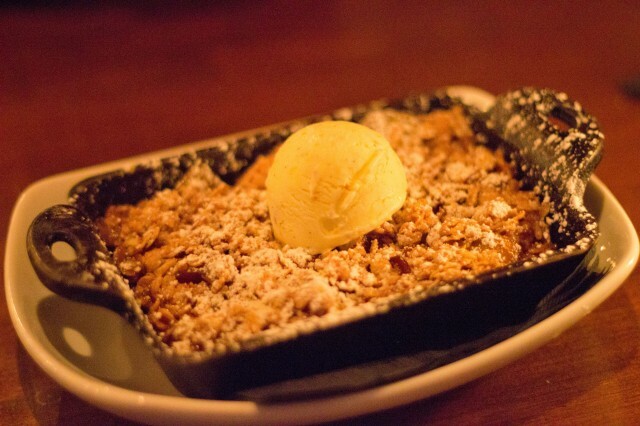 When the waiter put an apple cobbler in front of us, we were a bit confused. Though it was a mistake, they let us eat it anyways. The rolled oat crisp on top was my favorite part. The vanilla ice cream and the oats made a nice mix in flavors and textures. Hot, crisp oats with cold, buttery ice cream was a great combination. This is probably the best rice pudding I ever had. Not that I order rice pudding everywhere I go, and granted, I always get the prepackaged ones from the market, this one was pretty good. The rice had a nice bite to it and it wasn’t cloyingly sweet. The caramel on top had the perfect amount of sweetness. The pine nut crumbs on top gave the dessert some color and needed texture. All that was missing was a nice warm crunchy churro. My favorite dessert of the night goes to the butterscotch pudding. A cup filled with an addicting pudding, topped with whipped cream was all I needed. 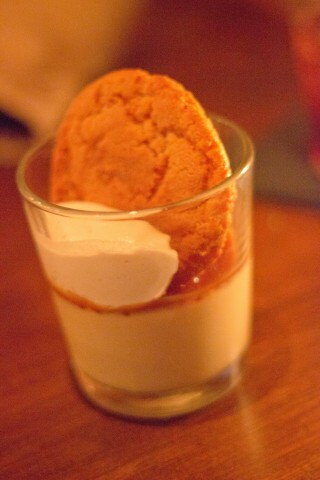 It was sweet, but not too much, and eating this creamy custard was perfect with the peanut butter cookie. Each creamy bite with the childhood taste of butterscotch was great. I wouldn’t mind it if all three desserts was the butterscotch pudding. This was such a perfect end to our near endless meal. Eating at Lazy Ox Canteen was fun and delicious. Sitting in the corner, full view of the kitchen with a preview of every dish to come was exciting. The atmosphere was relaxed and friendly, and our waiter had his undivided attention to us. With this combination of quality food and perfect service makes Lazy Ox a special place. Grab a beer, get some food, and relax.